In the U.S., an estimated three out of four adults have some level of gum disease, and many don’t realize it. Gum disease is the inflammation and infection of the gums and the surrounding tissue. Generally caused by bacterial plaque, it is the biggest cause of adult tooth loss. Plaque, a thin, colorless film, is caused by bacteria in your mouth and it develops on your teeth. 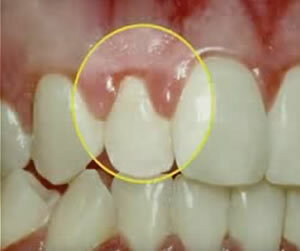 Left untreated, bacterial plaque will harden to tartar. A rough, porous mineral buildup usually yellow or brown in color, tartar forms at and underneath the gum line. Tartar excretes the toxins that cause gum inflammation, resulting in the development of periodontal pockets that hold even more toxins and bacteria. This condition can lead to the loosening of the teeth, or even make teeth fall out. As the condition worsens, the accumulated toxins and bacteria move deeper into the jaw to destroy the bone that holds your teeth in place. Gum disease can wreak havoc on your mouth, but it can also cause other health concerns. Research has linked gum disease to problems such as heart disease, osteoporosis, stroke, and complications with diabetes. Because the symptoms are initially mild, many people don’t realize they have gum disease, which can allow the condition to worsen. You may have an increased risk for gum disease if you smoke, have diabetes, take certain medications, endure excessive stress, or don’t eat properly. Periodontics is the area of dentistry that focuses on gum disease treatment. If caught in the early stages, your dentist can reverse gum disease. To begin, the dentist will scale the teeth to remove plaque and calculus, and plane the roots to smooth them. The doctor may also prescribe antibiotics to clear up any infection or inflammation. Advanced cases may require your dentist to surgically trim the gums, disinfect the tissue, remove the hardened plaque build-up, and re-contour the damaged bone. My gums bleed when I brush. Should I be worried? If you had bleeding on your arm or leg, you would check it out. Because bleeding gums can indicate a more serious problem like gum disease, you should make an appointment with your dentist to check it out. Although there is a genetic component to gum disease, other factors, like lifestyle choices, age, and oral health habits, can also influence whether you develop this condition. Talk with your dentist to find out if you have other risk factors for gum disease. The best prevention is taking proper care of your teeth and gums. Good brushing habits, regular flossing, and routine dental visits will go a long way to avoiding periodontal disease. What is the cure for gum disease? Unfortunately, there is no cure for gum disease. However, proper treatment and good home care can stop the progression of the disease and restore your oral health.